Making a wedding cake from scratch is an ambitious project with no room for error. Luckily, Wilton made a round cake pan set just for decorators that anyone can buy. Now, even home bakers can bake perfect layered cakes on the first try. The bottom cake tier is the trickiest layer because big cakes tend to cook quickly on the edges before the middle properly sets. Fortunately, these pans have a heated core that distributes the heat evenly across all the batter. Once your cakes are baked and slightly cooled, these pans help you avoid yet another disaster by easily releasing the cake. You can cover up a lot of mistakes with frosting and fondant, but a bride will certainly notice if her cake is in pieces. Use these pans and save yourself some anxiety. Who makes cakes for their pets? As it turns out, a lot of people do! This bone-shaped, dog-centric silicone cake pan is popularly used to bake pet-friendly treats for birthdays and special occasions. Since whipping up a dessert for a dog doesn’t carry the same pressure as baking a four-tiered wedding cake, there’s a lot more leeway for imperfections. Your pup won’t know if the peanut butter cake you made last week had the perfect rise or crumb texture. He’ll just be happy he got a special treat. Angel food cake has different pan needs than a typical cake. It requires something called a tube pan—a ring-shaped pan—to help it bake evenly. The tube in the center adds more surface area to heat the batter and it allows the delicate cake to rise by grabbing the sides. A great tube pan has tiny feet that sit above the rim. Angel food cake needs to sit upside down on a cooling rack after it bakes so it doesn’t collapse. The feet make sure air can circulate as it cools. The Chicago Metallic Angle Food Cake Pan has three feet that stick straight up around the top rim. This nonstick pan also comes apart into two pieces. The bottom detaches from the main ring so you can easily remove your cake once it’s ready to serve. Aluminum is an ideal material for a cake pan because it heats up quickly and cools down fast. It also reflects heat well, which minimizes hot spots. Unfortunately, natural aluminum is susceptible to corrosion and reactions with certain acidic ingredients—like citrus fruits or tomatoes. You probably won’t be baking up too many tomato cakes. Hopefully, though, a tangy lemon or orange cake is in your dessert rotation. Luckily, this 3-inch-deep aluminum pan from Fat Daddio is anodized. That means it went through a special (and totally safe) chemical process to become more durable and rust resistant against those tricky ingredients. You can feel free to add in as many acidic ingredients as you want without the fear of rust. Square cakes actually bake a little differently than round cakes. This is due to the way the pan's shape distributes heat. Some square pans can cause the middle of the cake to rise more than the edges—a baking phenomenon called doming. If you don’t want your square cake to look like a beach ball in the center, you need a well-vented pan. This nonstick 8-inch square pan from Wilson heats evenly and has a convenient lip to easily move it when it’s piping hot. As a bonus, this set includes two square pans. Many of the cakes you’ll bake at home may be classic round birthday cakes. You don’t need fancy equipment to get the job done, but you shouldn’t grab any old pan off your local grocery store shelf. Instead, you'll be happy with this sturdy round cake pan from USA Pan. It will help ensure your celebration isn’t overshadowed by a dessert disaster. The 9-inch pan has a nonstick, BPA-free coating that releases cakes easily and cleans up quickly. The bottom of the pan has a fluted design that adds to the nonstick properties and keeps the pan from warping. Plus, the pan comes with a lifetime warranty in case you need a replacement. OXO knows what it’s doing when it comes to kitchen products. This particular rectangular pan is made of commercial-grade, aluminized steel to distribute heat evenly and quickly. The Swiss-engineered nonstick coating is resistant to scratches, stains, and corrosion. The pan’s textured bottom provides extra airflow by minimizing contact with the batter. This means your cake will bake up perfectly every time. 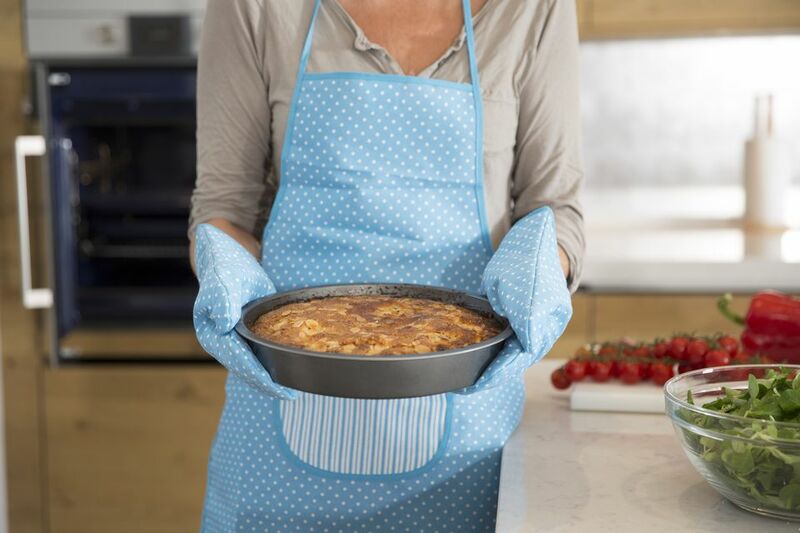 The pan’s unique square-rolled edges add extra durability and give you something to grip onto when you’re moving the pan from the oven to the countertop.